Here is a way to get custom chairs for your home at big savings. I have been on the hunt for two sitting chairs for one of my kids rooms. Upholstered chairs are not cheap, and after looking around for quite some time now, it looks like its going to cost me somewhere between $500 to over $1000 to add two new chairs to make a seating area. 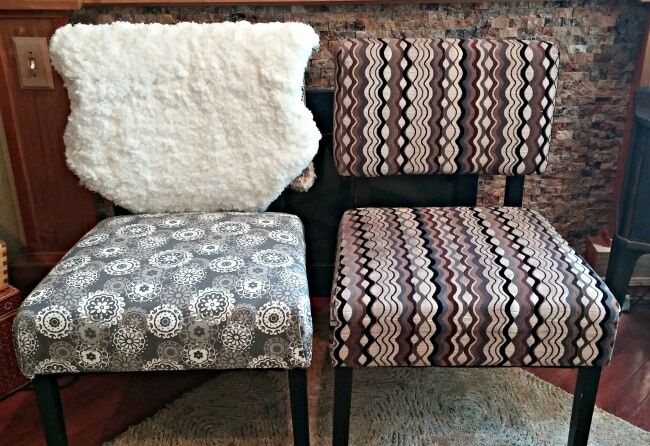 So, I thought about re-upholstering a couple of chairs that I had on hand. 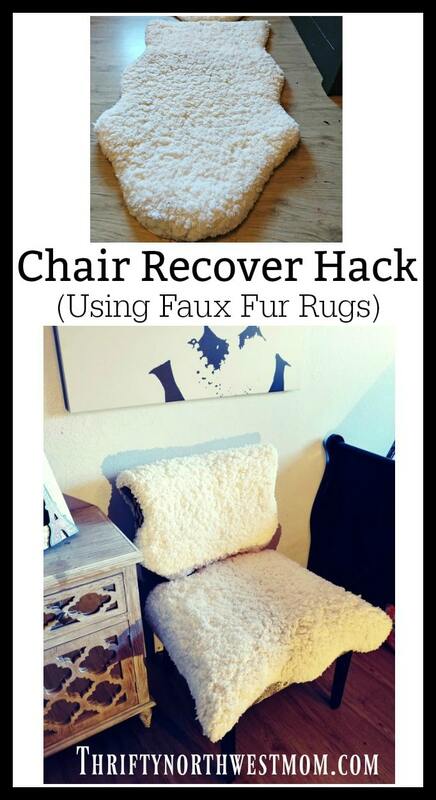 Then I saw theses cute faux fur chairs at one of the import stores, and was inspired to use this hack to “recover” my chairs! 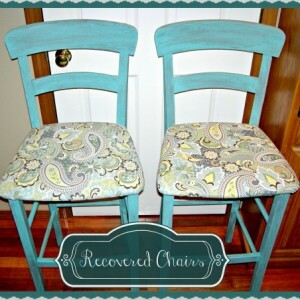 I put recover in quotes, as all I really had to do was toss two small throw rugs over the chairs for a completely new look (and they are so comfy too). I will show you two ways you can do this hack and one option cost me $25 and the other $40, so its a big savings over what I was looking at spending. Our inspiration chair (it cost $299, ours cost us $40 each)! My daughter and I came across these chairs at World Market, but they were $299 per chair. We loved the look for her Paris themed room, but I could not swallow the price tag, so we decided to make our own version for a fraction of that cost. 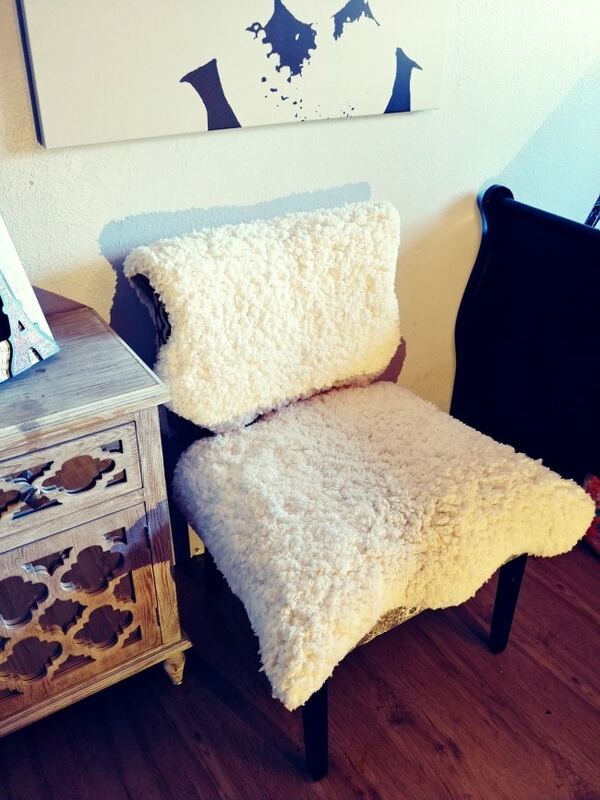 This chair got me thinking about the small faux sheepskin rugs I have been seeing around and how I could use these to make it simple to customize these two chairs that I had at home and wanted to update already. 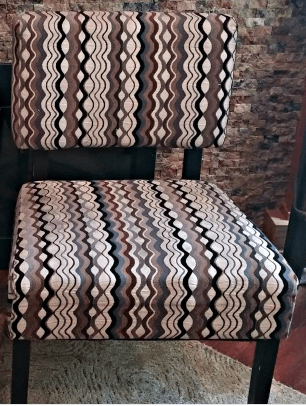 I happened to have two of these accent chairs already, but this geometric design was not going to work in her room (and honestly they were not working anywhere else in my house either). 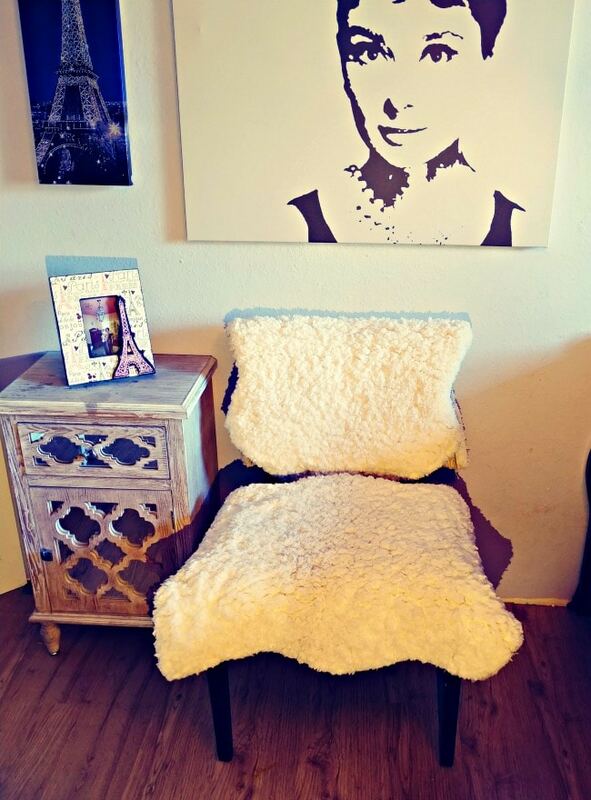 This idea could still be a great money saver for you, even if you have to buy new chairs, since the price of these faux fur chairs is so high. I was able to find a number of this style of chair for well under $100 at stores like Ross or online at Wayfair.com for under $100 (this set of two chairs is $171.99, that’s $86 each) . That means that even if you bought two of these chairs new and put $25 into customizing it for your house, you could have a chair that is perfect for your decor for around $106 to $126 per chair (depending on materials, etc.) – which is still a great price (find more options on chairs that will work with this idea here). If you already own a couple of chairs you are just wanting to give a new look too, then this idea can mean big savings for you. We started by finding two small faux fur rugs (used the 2×3 size rugs to toss over our chairs). I grabbed mine at my local TJ Maxx for $19 each, but also saw some similar rugs at Ikea for $14.99 each here. Wayfair is another great spot to look for them (we found the 2×3 size faux fur rugs starting at $24.99 there). We went with cream, but the faux fur rugs come in fun colors like pink, grey, blue and more these days too. The simplest way to do this chair recovering hack is to buy two of the small faux fur rugs, and simply to throw one rug over the top of the chair, and the second over the seat of the chair like shown above. One of my daughters has a Paris themed room, and so this is what we ultimately did for her room with the chairs, and she loves them. It made the chairs much more comfortable to sit on as well. We purchased rugs that had some rubber grip on the back to keep them from sliding on the floor, so they stay on the chair nicely from those grips, and we do not have to readjust them very often. You can stretch your budget a little further if you recover part of the chair and then just use one rug on the top or bottom of the chair. This is because you can get a yard of material for around $5 and that should be enough to cover part of your chair. If you want to use this method to save even more money, this is what we did. The two chairs that I had were a great scale and shape for a small seating area. If you’re looking for chairs, consider paying more attention to the scale and shape, and then add your own custom touch to it. Start by gathering your supplies. 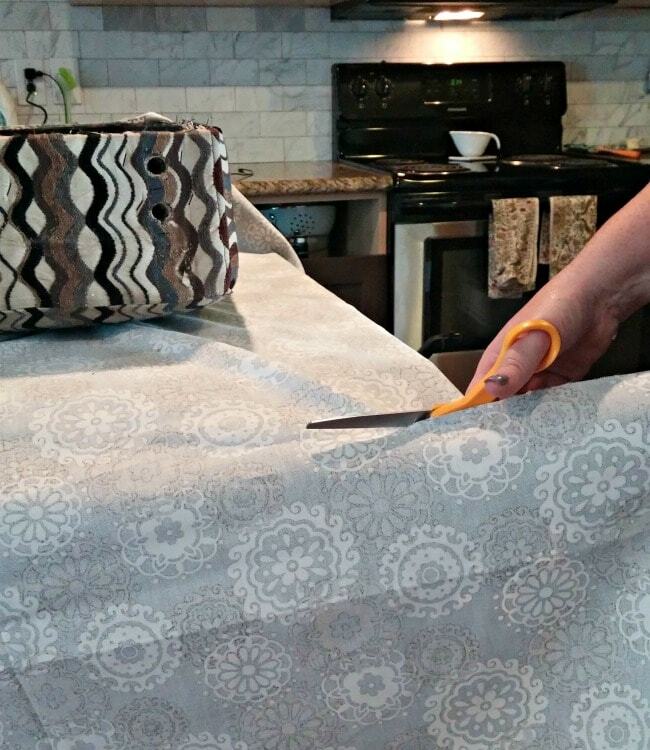 Measure your chairs to see how much fabric you will need (we needed one yard for the bottom of each chair) and then head to your local fabric store, and picked out a decor fabric that you like. 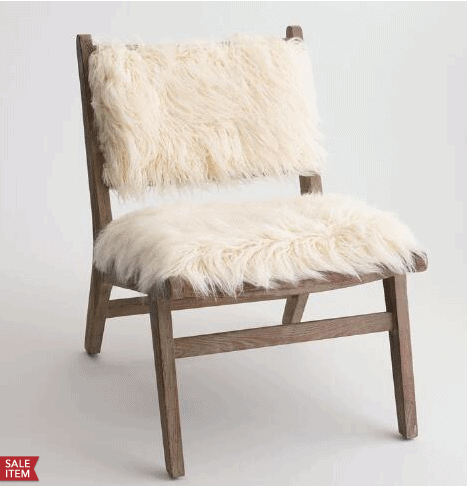 You will also need two small faux sheepskin rugs (this is if you are doing a pair of chairs). I paid $6.99 per yard of fabric, so I spent about $27+ tax per chair I have a staple gun, and staples, but you will need to grab those if you do not, as well as a good pair of scissors. As we mentioned above, we chose these really soft and cozy rugs, that I picked up at my local TJ Max for $19.99 each. 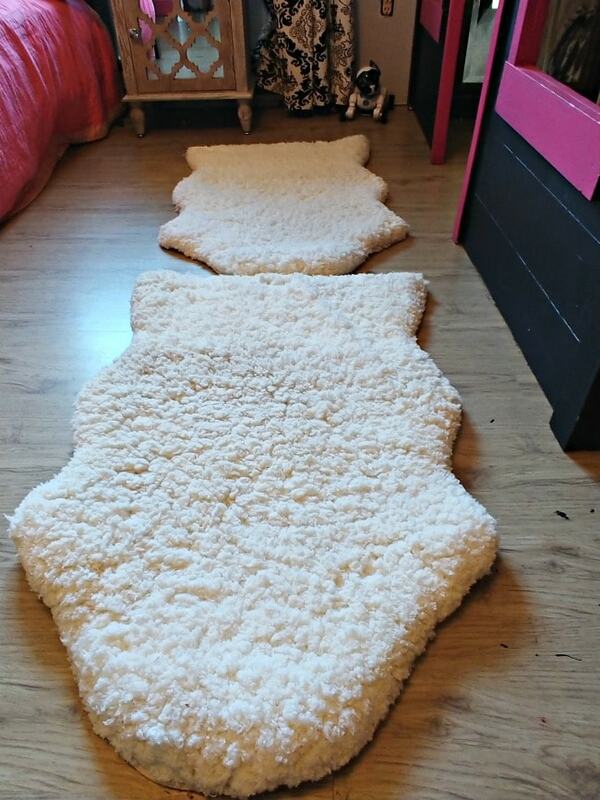 I also chose cream, but these style of faux fur rugs come in all kinds of colors, from white to black, brown and even fun pinks and blues if your doing something for a kids room, etc. I went with faux sheepskin look, but you could look for a cow hide print or something funkier if you want, and a coordinating fabric. Take the chair apart. There is no need to remove the old fabric, you can add the new fabric right over the top of it. 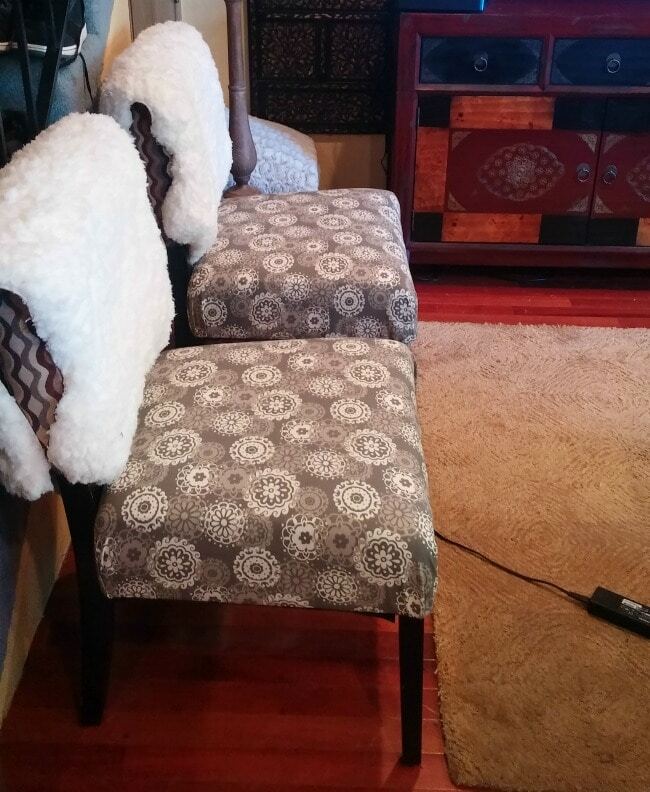 Take one yard of your fabric and situate it around the chair seat, and staple one side. Then pull tight and staple the opposite side. Then each of the four sides to cover the chair seat in the material. ** Note – one yard generally covers these standard size accent chairs, but you will want to be sure and measure the area you want to cover and take those measurements to your fabric store to make sure you buy the right amount of fabric for the area of chair you are trying to cover! We had purchased two yards so cut it down to size before stapling. 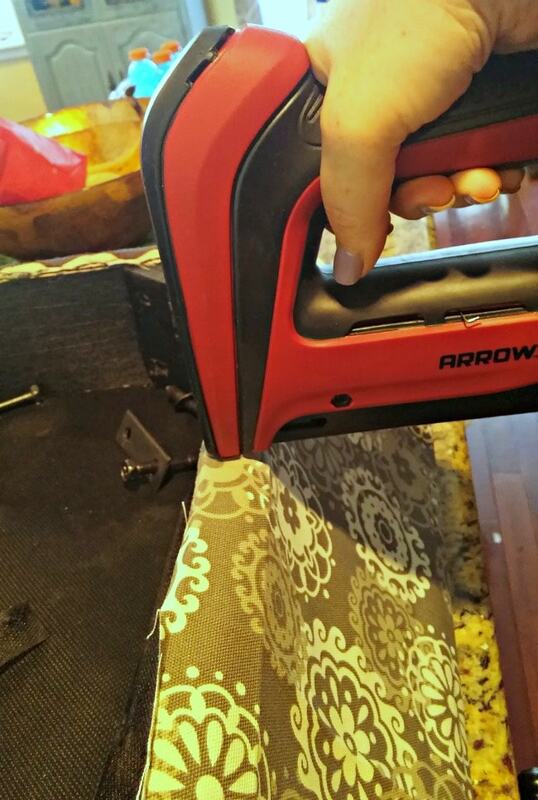 Once you have stapled it on, assemble your chair again. We simply added the cover that had previously been on the chair back to it once we had stapled the new fabric over the old. 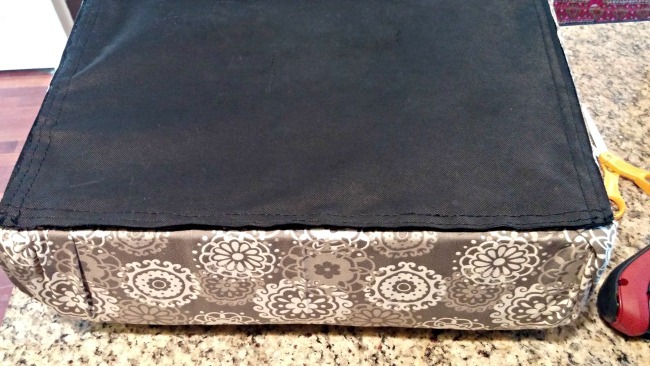 If your chair does not have a cover on it, and you want one, you can cut a piece of felt the size of the bottom of your chair and attach with Velcro strips. Toss the throw rug over the top, and you are finished. So simple! Here is a side view of the chairs. We have ours placed in the room, so you don’t see the side really, but I wanted to show you this view in case you were wanting to place them in an area that this might be more visible. 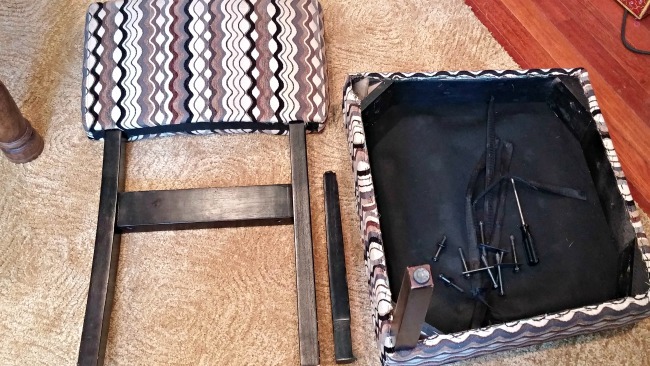 You could recover the top of the chair in a neutral fabric to avoid this too. In the end, it’s the simplest recovering hack we have used and she gets plenty of compliments on her chairs (and we saved a ton by not having to buy new chairs)! 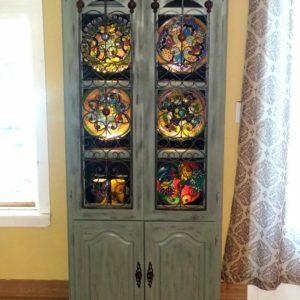 Re-purposing bookshelves and candle abras into a hutch! 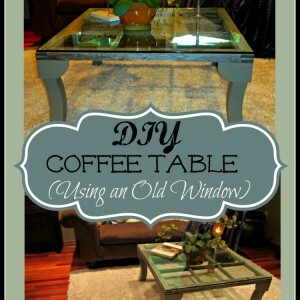 Find more DIY projects for your home here too.